A very short blog today as I am having an early night ready for a 3.40 am alarm call to go to work at the National Wildlife Crime Unit. No particular need to start early but (1) I like early starts anyway, and (b) I hate sitting in traffic jams. Not too many of them around at 04.30, even on the M90. I’ve had two great days cutting up a windblown ash tree. One large part of the lower trunk is right against the fence, so I’ll maybe need to get a tractor to pull it out the field a bit before I can cut it, but the fields are too wet just now to try that. I had two chain saws, a large one and a small one. At the very last cut of a substantial piece of trunk I got the large one jammed and had to use a hand saw to free it. In the quiet intervals when I switched the chain saw off, I could hear great-spotted woodpeckers drumming on trees not too far off, and a robin hopped amongst the leaf litter I was disturbing, no doubt taking advantage of insects scurrying about. There were plenty of fallow and roe deer marks in the soft earth round the ash tree, and most of the thin and whippy branches now at ground level had been eaten. I’m sure rabbits rather than deer would be the culprits here. Interesting that they eat ash bark (and especially so when there is no shortage of good grass) but I think the bark of the beech tree must be their favourite, which they sometimes strip from growing timber during hard times. 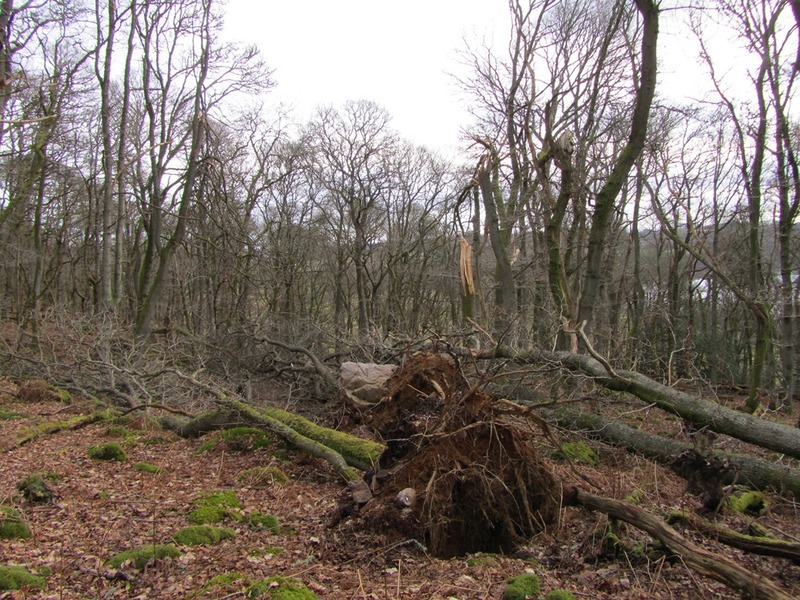 There are two blown oak trees just beside the ash, and the small chain saw was hand for nipping off the (one time) thin upper branches of the first of the oaks. This oak is now ready for the next visit, with the fiddly work out of the way and with decent timber for logging now easily accessible. I’ve brought two loads home in my car – probably half a ton in all – but the next load will be a much bigger one, and I will borrow the estate Land Rover and trailer. I picked Friday and today (Sunday) for these jobs and the weather was perfect; so hot in fact I was working in shirt sleeves for a while. With the hard work and a diet of fruit during each of the days I may have lost a bit of weight – much needed with sitting at a computer most of the day. Anyway I’m looking forward to going to work tomorrow for a rest! This entry was posted in Uncategorized and tagged cutting logs, great-sottted woodpecker, National Wildlife Crime Unit, robin. Bookmark the permalink.